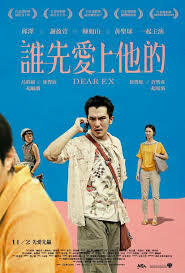 Recently available on Netflix, “Dear Ex” (2018) tells a story of a Taiwanese teenage boy who drifts apart from his mother after his father’s death. Both of them are trapped in a confronting situation with a young man who turns out to be the father’s lover for years, even before the boy’s parents were married. After finding out that the father left all of his insurance money to the man, the boy’s mother rushes into the man’s life and disturbs the peace that had once prevailed. The story revolves around a central figure who has already passed away, and the three main characters confront and compromise with one another through recalling their mutual memories with the deceased man. For instance, Chengxi (Joseph Huang), the teenage boy, has never had a tight bond with his mother Sanlian (Ying-xuan Hsieh), and the relationship they have had seems to be more distant after the death of his father. He has always known that his father is gay, and when Sanlian finds out and confronts with Jay (Roy Chiu), the “mistress,” Chengxi impulsively moves in with Jay as a rebellious act against his mother. During the days he spends with Jay, Chengxi gradually finds out about the deep love Jay still has for his deceased lover, which makes the boy also ponder the feelings he has for his father. Through a series of other hilarious yet warm-hearted incidents, Sanlian finally improves her mother-son relationship with Chengxi — she learns to show more caring side to her son, and the latter grows to understand her previous mental situation. This is supposed to be a tragedy, yet through the ways it is presented, we mostly receive a pleasant effect. What I found creative about the film is that there are animated doodles which seem to be drawn by Chengxi — the narrator — throughout the movie, adding a delightful mood to an overall sad story. The directors Mag Hsu and Hsu Chih-yen purposefully included the doodles during the scenes where they could not afford good cutting technologies. The extremely low budget contributes to the ultimately visually pleasurable atmosphere to the movie’s overall effect. The intense relationship between the wife and the “mistress,” as well as the seemingly-suffering kid does not evoke any happiness in the audience, and the memories they mutually share with the dead father add on to that grief. Yet the constantly appearing doodles, along with the warm color tones and the humorous narration by Chengxi build up a sharp contrast, reminding us there will always be positive aspects to things that are negative. “Dear Ex” is a delightful dessert that is worth being enjoyed, one that often turns tragedy to comedy, and it teaches us about the situation LGBT groups have in the broader society of Taiwan. People with homosexual identities are still forced to make choices in favor of the heteronormative context, and the so-called “correct marriage” can be fragile. Even though the film and media circle welcomes productions with such topics, and the filmmakers are already able to tell a story of love on the foundation of homosexual relationships, there is still much to work to do regarding sexuality recognition and inclusiveness in Taiwan. Carrie Jiang '21 is a film studies major and possibly Asian studies minor. She loves films, photography, and food.